Testing your registration setup is an important part of the registration process. This process allows you to view how your users will see the registration. First, you need to prepare the registration so you can test it. In the side menu click Team Admin > Registration Admin. This will take you to Member Reg Admin. 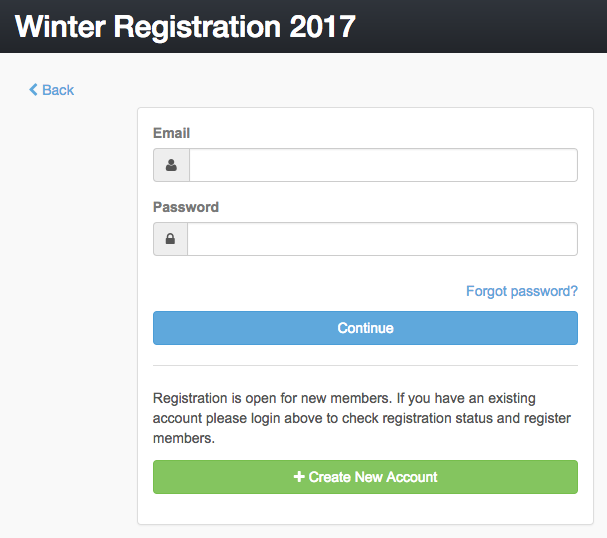 Click the upcoming online registration name (not the checkbox) you would like to test. This will take you to the Basic Setup page. 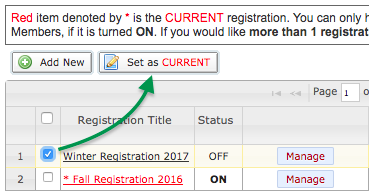 Make sure Turn on for Registration is set to NO - Disabled. 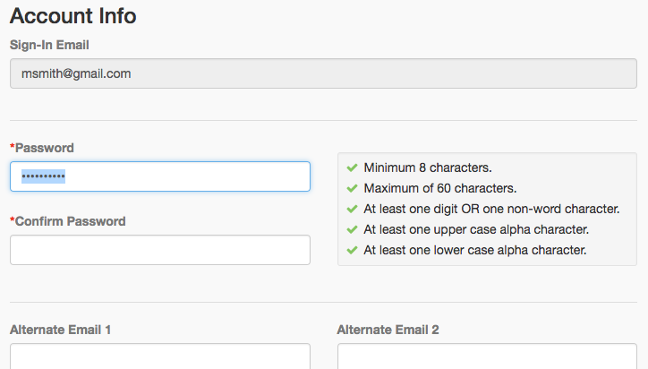 If needed, check the box by the registration you want to test and click Set as CURRENT. This will turn its name red. Now that your Online Registration is set up to test, let‘s access and test your settings. 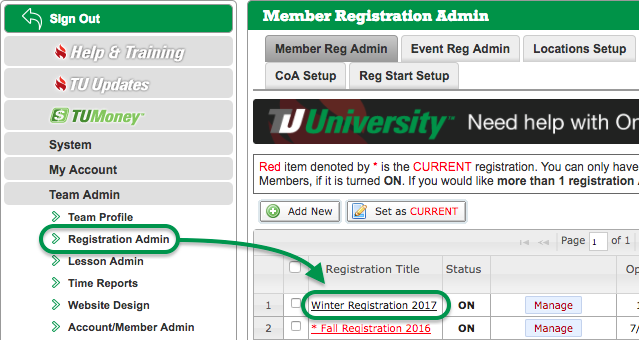 Note that all registration screens are mobile friendly. This will take you to the registration title page. Note the red banner at the top letting you know only Super Users can test the registration. A user will click Continue or Check Status to either begin the registration process or check the status of their registration. If someone is not logged in and clicks Continue or Check Status, it will take them to a login screen where they can either enter their email, password and click Continue, or click + Create New Account(Note: You will not see the below screen while testing because you are logged in). 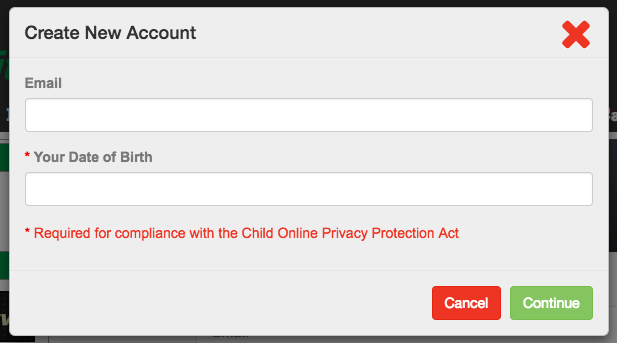 Those who click Create New Account will then enter the email they want to use and their date of birth to make sure they are at least 13 years old. If a returning user's Account information is complete, they will be taken directly to Member Selection below. New users and returning users with incomplete Account information will be taken to the Account Info screen. After logging in or creating an account the user is asked to fill out their Account Info; for new users, this includes creating a password. There are potentially five sections to fill out here: email addresses, billing information, parents/guardians, insurance, and emergencies. After filling out all required fields marked with an asterisk (billing information and any fields defined on the Basic Setup Page), the user is allowed to Continue. However, if the person owes money and you choose to connect this registration with outstanding balances, the user will see what they owe instead and be prompted to click either View Billing History, or I’ve reviewed the Billing History & want to Proceed, which will include their outstanding balance with their registration and charge it at checkout. Now the user is at the Member Selection area. If their account information is complete and they do not have an outstanding balance, they may have been brought straight here from the login screen. If you added content to the Member Selection Msg tab, users will see it displayed here. The user can click Edit Account Info go back and do that (useful for those who were sent straight to the Member Selection screen from the login screen). 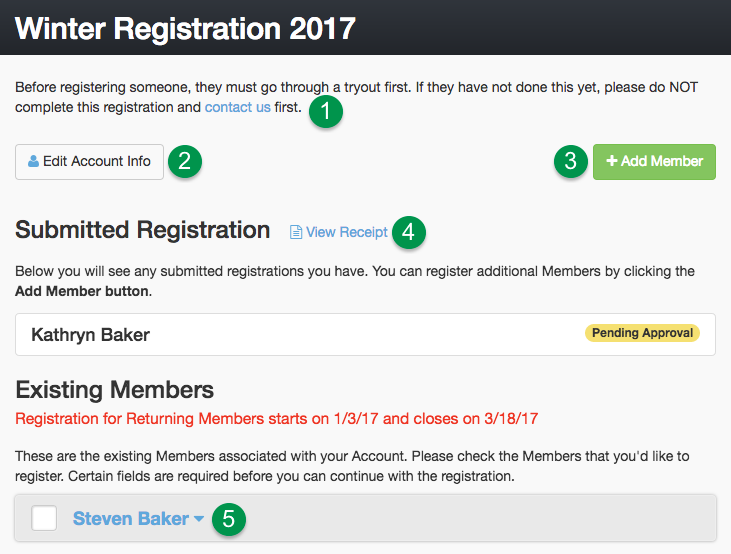 If this is a new account or if the user wants to add a new member/athlete to their account they can click Add Member, fill out the form and click Add. If the user has previously registered some or all of their athletes, they and their approval status will appear in the Submitted Registration section. Click View Receipt to see the details. 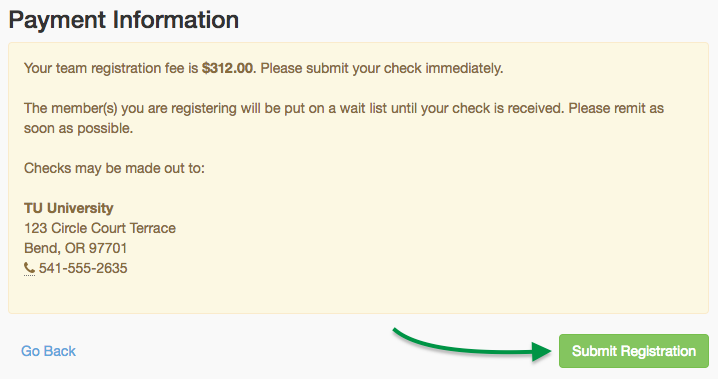 Click the checkbox by a Member’s Name to register them. This allows the user to verify information including birthday, name and so forth as well as have the user select the location, payment options, and registration group. Note that gray fields cannot be altered; this is to protect the integrity of swimmer IDs tied to meet results. 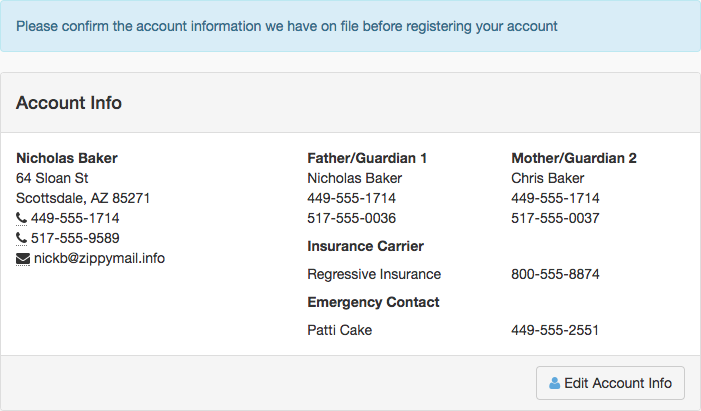 Users will need to contact a team Super User if they need any of those fields altered. If you are a USA Swimming team and [Ask USA Swimming Transfer Question] Entry Field is set to YESin the Basic Setup tab, users will see Are you transferring from another team? 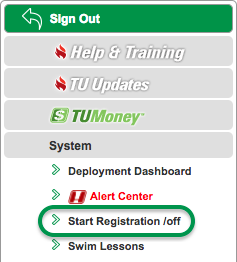 If the user selects YES, you will see a red [T] for "Transfer" by the athlete's name in Manage registration. Register to this Group lets the user select from the Registration Groups you selected in Fees Setup. If you have defined Payment Options as well, the dropdown will be a combination of Registration Groups and Payment Options. 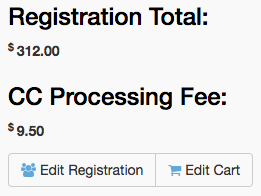 When you click View Details you will see a description of each registration group including name, payment options (if defined), age range, availabilit, and a description. 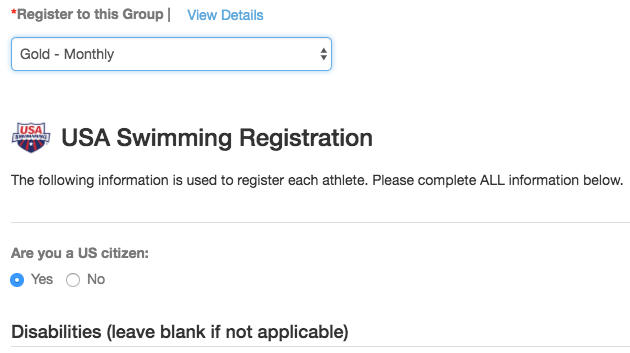 If the user selects a Registration Group with USA Swimming Reg set to Required, the form will expand and show USA Swimming Registration fields to review and complete. 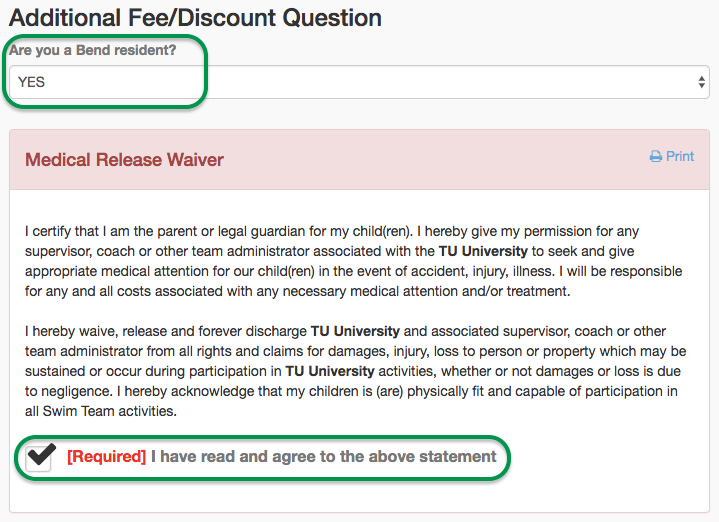 The Additional Fee/Discount Question and required/not required Waivers also appear on the Member Selection page. 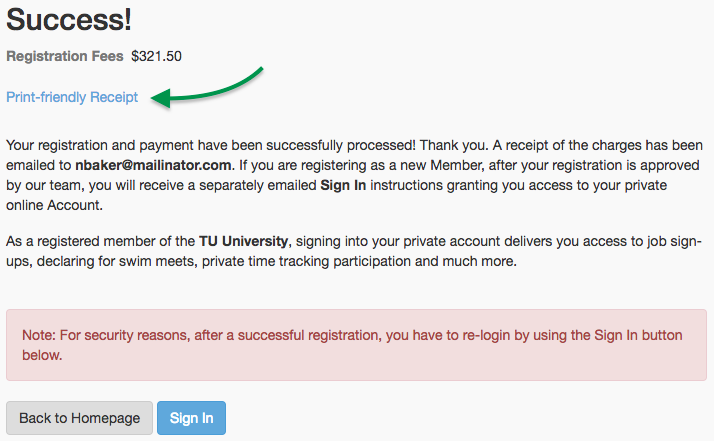 After entering all information, answering questions and agreeing to waivers, click the Continue button to move to Fees Summary. In Fees Summary the user first has the ability to Edit Account Info if any of it is incorrect. Next, the user can review their Registration Fees and more. We will describe where the various fees are defined. The user can take action on items 1, 4, 8 and 9. Click Add/Edit Members... to do that if they need to change anything (Go Back does the same thing in the lower left). 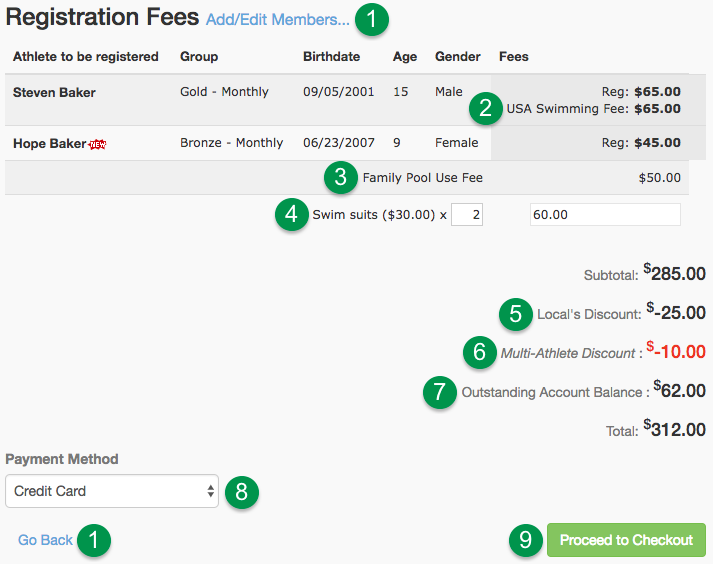 This USA Swimming Fee is an Other Per Member (Athlete) Charge. Family Pool Use Fee is a required Per Account (Family) Charge. Swim suits is an optional with quantity Per Account (Family) Charge. User enters a quantity and SwimOffice multiplies it by the price of each item. Local's Discount is an Additional Fee/Discount Question. Multi-Athlete Discount for two athletes. User had an Outstanding Account Balance and you decided to connect the balance to their registration. Choose a Payment Method — Credit Card, Check, or Custom Payment, depending on what options you allowed in Payment Setup. Proceed to Checkout takes the user to the Payment screen. 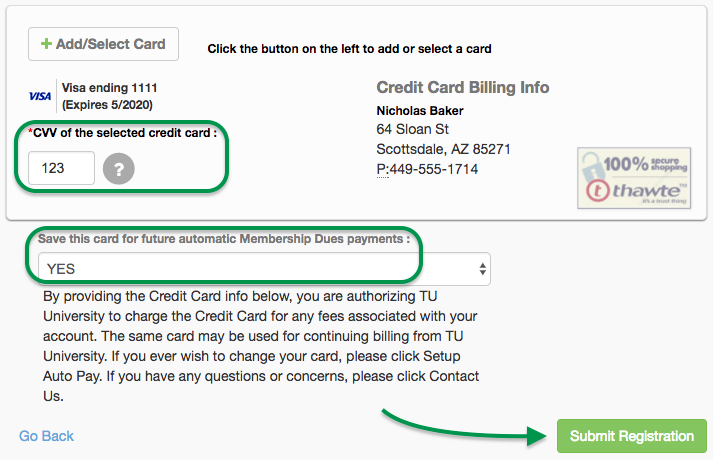 In the Payment area, the user will now see the registration total, credit card processing fee if you have elected to charge it, and can click Edit Registration (go back to Member Selection) or Edit Cart (go back to Fees Summary). Below that they will see their Billing Details. Credit card payers can either click + Add New Card, fill in the CC details and click Next, or click Use this card if they already have one on file. Once they have added or selected a card, they will enter the card's CVV. If you made it optional to Allow Credit Card to be saved for Auto Pay in the Accepted Payment Methods, they can select YES to save it. Finally, they will click Submit Registration. Check payers and Custom Payment payers can edit their billing info and will see payment instructions. They will click Submit Registration when ready. Submit Registration takes the user to the final Success area. In test mode, you will not be able to submit it, but we will show you what it looks like. On the Success page, the user is congratulated on signing up with the team. Those paying by check will again see a message that their member(s) will be placed on a wait list until their check is received, and where to mail the check. A link to a Print-friendly Receipt is available. Your personalized success message is displayed, defined in the Success tab of the Basic Setup page. 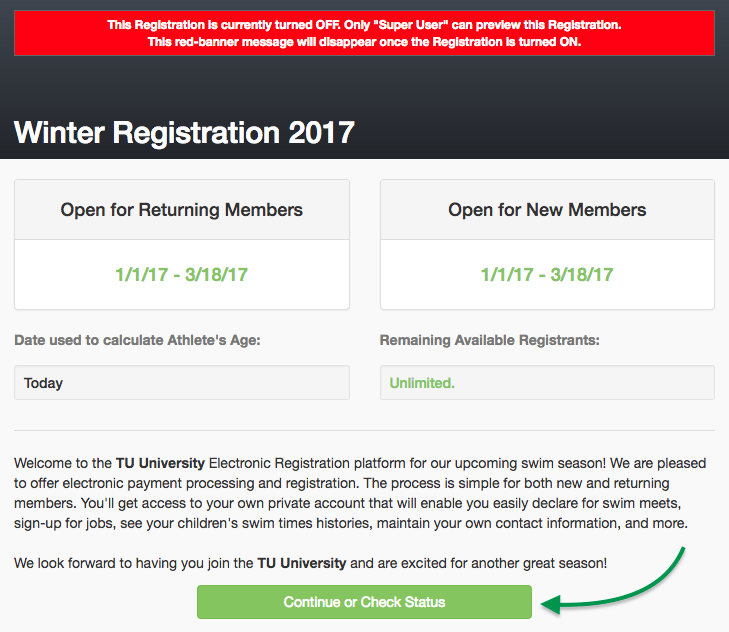 The user is finished with the Online Registration process, their information and payment captured and ready to start the season. With your Online Registration tested, it is time to launch it. In the next step, we will show you how to open your Online Registration.